It is thought that wild cougars disappeared from Wisconsin by about 1910. On June 11, 2011, a mountain lion was killed on the busy Wilbur Cross Parkway in Milford, Connecticut. He was hit by a car. I don’t live in Connecticut—Wisconsin is my home—nor have I ever seen this particular cat. But I still feel the two of us share a connection, probably because he walked across my state, defying all those who initially said that such an adventurous undertaking by a cougar wasn’t possible. It is thought that wild cougars disappeared from Wisconsin by about 1910. 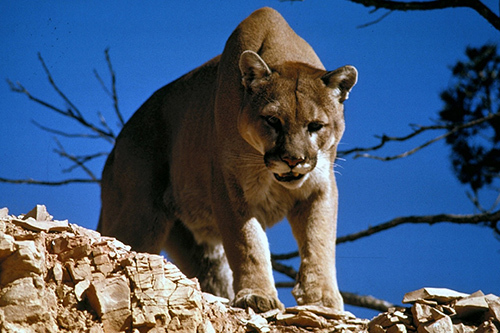 Although reports of seeing them started surfacing again in the 1940s, such sightings were passed off as being of escaped captive mountain lions or misidentifications. But then, on January 18, 2008, a cougar visited a barn in Milton, Wisconsin. This time, the evidence was undeniable: DNA taken from a small drop of blood that came from a cut on the animal’s foot identified him as a wild cougar from South Dakota. Unfortunately, four months later, police in Chicago shot him. Male mountain lions normally disperse in search of females, but usually travel only about a hundred miles. But in December 2009, police in Champlin, Minnesota, spotted another cougar. Later that month, he was tracked by Wisconsin Department of Natural Resources personnel in the state’s northern counties of St. Croix and Dunn. Based on tracks and other evidence, biologists believe this cougar then passed the city of Eau Claire and Clark County before heading north. In May, a trail camera caught a photo of a cougar in Michigan’s Upper Peninsula, which is believed to be the same animal. 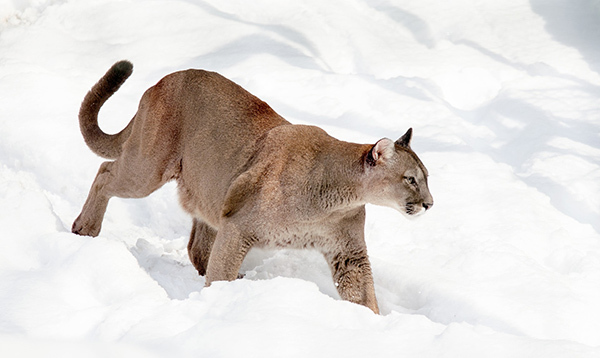 From Michigan, the cougar probably passed through Ontario, Canada, and then crossed into New York, over the St. Lawrence River, before reaching Connecticut. The cougar, a young male that weighed 140 pounds, probably came from the Black Hills of South Dakota and had struck out a couple of years ago to establish his own territory. After the cougar was killed, officials were able to reconstruct his wanderings by matching DNA from his tongue with DNA samples taken in Minnesota and in Wisconsin. Because genetic material—analyzed by the United States Department of Agriculture’s Forest Service Wildlife Genetics Laboratory in Missoula, Montana—was used to follow his movements, there was confirmation that he traveled somewhere around 1,600 miles, according to Adrian Wydeven, a wildlife biologist with the Wisconsin Department of Natural Resources. His epic journey is the longest ever recorded for a mountain lion. The previous record for a male cougar dispersal was 663 miles, while the average dispersal is only about 100 miles. So what compelled this particular cougar to keep going, to keep traveling the world until he found what he was looking for? Perhaps what motivated him to wander may be what motivates us all: an urge to move through the landscape. I also have a dream of walking across the state. My corridor, however, would be the Ice Age National Scenic Trail, a 1,200-mile hike. 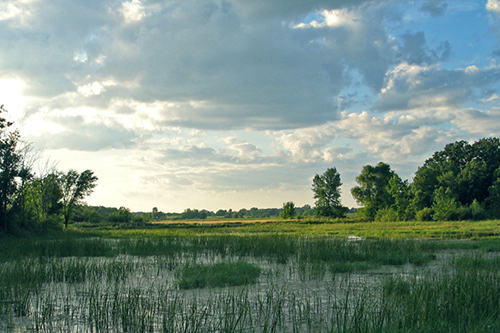 The trail traverses Wisconsin from east to west, roughly following the shape of a glacier that retreated 10,000 years ago. It, too, would be an epic journey. A lot of people I know say I can’t do it. But a certain mountain lion tells me I can. Are there any adventures that you’ve dreamed of undertaking, despite the naysayers? Ya, sure! Give my best to the Norwegians you’ll probably meet along the way. in Minnesota. More than likely, a few will probably join you, just for fun. Oh, those Norwegians! You just never know where they’ll show up, especially if it sounds like a good time. I’m sure that cougar passed through many places that would have made a good home territory. Especially in Wisconsin with few, if any, other big cats as competition. Seems like it just wanted to keep going to see what was over the next hill or around the next bend… a feeling most of us can relate to! I just can’t let this one pass me by. Not that I ever let much adventure pass me by. But one adventure is really precious. When I was told that I needed heart surgery and wouldn’t be able to do my adventure treks any longer I said, ” Well I’m going on one more white water canoe trip first then. It was early February and absolutely nobody would get in the canoe with me. I was 65 back then and finally I found my companion. He was 72. We went completely under 4 times, lost my camera, my binoculars, and all my equipment, lost my paddle and ended up using a stick, All of our food, all our water, Wind gusts up to 30 MPH and we stayed the course. But we saw the biggest eagle either of us had ever seen, lots of indigo buntings, a flock of bob-o-link, creepers and a relay team of king fishers too,. Then we had to carry the canoe out through briars and brambles, two stout barbed wire fences with bulls inside. I wouldn’t trade that memory for anything. I wonder if some animals have the gypsy gene, as some humans do. This might explain this cougar’s peripatetic style. You go, girl! Of course you can walk across Wisconsin; I feel another book coming on! As Helen says, just don’t wait too long. Years ago, a friend and I dreamed about walking across Europe, which all of our other friends said we couldn’t do. Jobs and raising children intervened, and “suddenly” we were too old to do it. We have had many other adventures through the years, many of which horrified our friends and mystified our family, but I still wish we could have found a way to do the trans-European hike. My wife and I live in South Florida; she has never seen a wild panther, and she is a native Floridian. We go into the everglades at least three times a month; cameras on the ready. We hope to see at least “one” before we die. They are there; they just don’t want to have anything to do with humans (I can understand this). If we do run across one we are ready to interact by remaining distant and allowing the panther the opportunity to accept, or reject us. We will be happy just to have seen one. I hope he wasn’t driven by hunger. I bet they can catch and eat most things on their path. That is a very touching article, Candy, and a very beautiful image, John. You could walk across WI !!! Don’t wait too long.